Normally, being surrounded by hungry sharks is not a good thing. But a Lincoln Casino slots player is up $20,000 after it happened while playing the Shaaark online slot at Lincoln Casino the other night. Danielle M, a new player at the casino, chose the Shaaark slot game that night after seeing shark attacks in the news earlier in the evening. "I thought I'd see if I could get some revenge," she told a Lincoln Casino customer service agent. “I played for about half an hour when suddenly the screen was filled with sharks,” she said. “I must have hit the maximum because all of a sudden I had $20,000 in my account!" Danielle plays lots of different slots but, after a $1000 spin not long after her big win, she’s been sticking with Shaaark a lot lately. 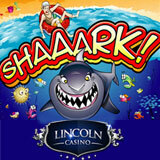 Shaaark is a 5 reel, 25 payline slot with a scatter that can trigger up to 25 spins where prizes are doubled. Lincoln Casino has over a hundred online casino games from WGS Technology.